Dinosaurs, their origins and how they became extinct have not been topics that we’ve discussed much in our house but that changed when we started reading Dinosaurs and Other Prehistoric Animals. This fascinating, beautifully illustrated book is packed full of information and my daughter has been very keen to show the book to friends and visitors. Dinosaurs and Other Prehistoric Animals first takes us back 3.5 billion years and shows the very first life forms followed by early land animals. Then come the dinosaurs! 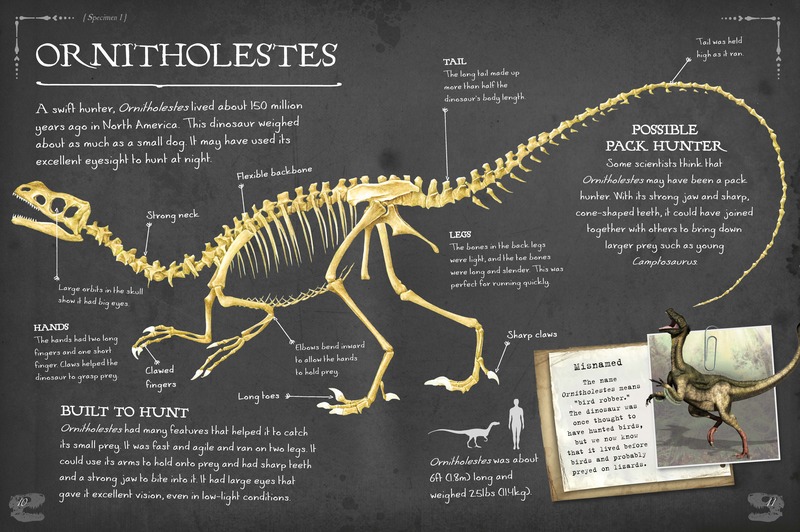 Beautifully illustrated double page spreads include information about dinosaurs’ diet, height, weight, body shape and scientists’ thoughts and opinions about how dinosaurs may have lived. A simple index and a more informative glossary are included which are great for introducing children to looking up specific information and also reinforcing the concept of alphabetical order. The glossary explains words that have been used in the book in a simple way that a child of any age can understand. My daughter learnt the meaning of the words ‘carnivore’, ‘herbivore’ and ‘extinction’ but I also learnt some new words – Ornithischian (bird-hipped dinosaurs) and Saurischian (lizard-hipped dinosaurs). A timeline shows how our planet changed and developed between the Triassic and Cenozoic ages, which dinosaurs and birds lived during particular ages and how the dinosaurs became extinct. The easiest way to describe the wonderfully informative, double page spreads is to show you one! Many of the dinosaur’s skeletons are shown with lots of interesting information about the dinosaur and the time that it lived. On this page we learn that Ornitholestes was a hunter, possibly hunting as part of a pack. Its tail was more than half the length of its body and its hands had two long clawed fingers and one short. The illustrations are clear and bold and information is given in bitesized chunks of text which makes it accessible to even the youngest readers. We love the dark blue cover with its gold embossed writing, the range of dinosaur skeletons shown invite all dinosaur enthusiasts to open the book to learn more. Dinosaurs eat stones to help mush up the food in their stomachs. Dinosaurs became extinct when a meteorite collided with the earth and the Ice Age started. A Diplodocus was as long as the width of five houses in our street (30 metres). We were so amazed by the size of some of the dinosaurs in the book that we decided to go out and measure how big they were in comparison to our street. Armed with the book, some chalk and a metre stick we first guessed how long the dinosaur was before measuring and we were stunned to discover that Diplodocus was two thirds as long as our street. We were soon joined by other curious children who, despite not understanding English, also enjoyed looking through the book and measuring with us. 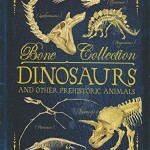 Dinosaurs and other Prehistoric Animals would make a great addition to a school library. 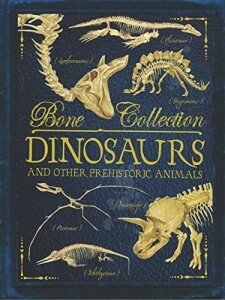 It’s a fantastic book to use as part of a classroom topic about dinosaurs from reception upwards. Thank you to publisher QED for sending us a review copy of this book. It is amazingly informative and has sparked some interesting discussion and lots of learning in our house. It’s brilliant and so well laid out that you don’t have to trawl through loads of information to find what you are looking for. I have learnt more about dinosaurs from this book than I have learnt previously, although I have taught dinosaur topics at school! I’m always fascinated by how big dinosaurs were! That is a stunning book – really informative and with a great range of illustrations. It’s brilliant and the illustrations are awesome! This sure looks a great book and it’s really good to get outside like you did as it makes it even more real. I love the illustrations. It was fun finding out how long the dinosaurs were, as well as being absolutely fascinating! Going on my To Buy list! Dinosaurs is my 6-year-old grandsons favorite right now. Thanks for sharing on the Kid Lit Blog Hop!